Happiest of Wednesdays to you, friends! How is your day going? Mine has been going well - two more days of work, and then a three-day weekend. What's not to love?! As you know, I love simple meals. I know I've talked about this before, and I feel like I'm beating a dead horse, but it's true. As much as I love being in the kitchen, I'm all for simplicity. Cooking healthy (and delicious!) meals shouldn't require super fancy and expensive ingredients. Basic ingredients that a normal person has in their cupboard - that's me! This particular meal is about as simple as it gets. You can bet it was delicious though! Easy baked tofu with couscous and roasted broccoli. And an Anchor Summer Beer for good measure! In a medium bowl, combine all of the ingredients except the tofu. Whisk to combine. Gently stir in the tofu until well-coated. Place tofu on a baking sheet in a single layer. Bake for 25-30 minutes - flipping halfway. 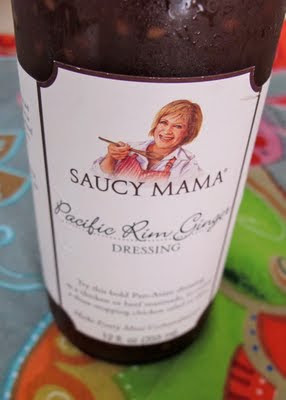 As for the couscous and broccoli, this Pacific Rim Ginger Dressing from Saucy Mama took it up a notch. I won some Saucy Mama products in a giveaway from Liz over at Little Bitty Bakes - thanks, Liz! Because this little side dish is very simple, I'm not even going to call this a recipe! I just cooked some whole wheat couscous (1/2 cup), roasted two cups of broccoli at the same time as the tofu - then threw the couscous and green veggie together. I topped it all with a little bit of the Saucy Mama dressing, and it was perfect! What's your favorite simple meal? Feel free to share links!